New Santa Rosa Beach location opening April 19! Skeletal irregularities place strain on the vertebrae and supporting muscles, tendons, ligaments and tissuessupported by spinal column. 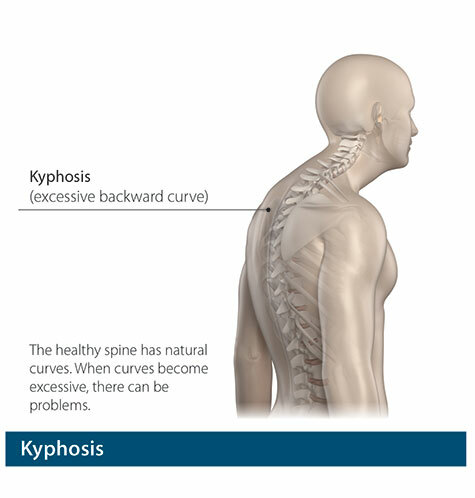 These irregularities include scoliosis, a curving of the spine to the side; kyphosis, in which the normal curve of the upper back is severely rounded; lordosis, an abnormally accentuated arch in the lower back; back extension, a bending backward of the spine; and back flexion, in which the spine bends forward. Spinal deformities can affect people of all ages but are most common in adolescents. The cause of these conditions are unknown,but abnormal bone and muscle growth are thought to be a contributing factor. 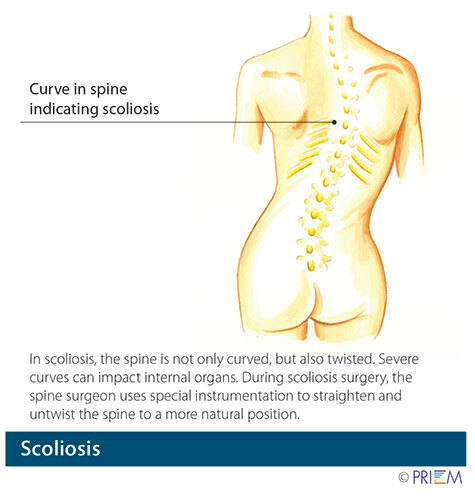 Spinal deformities become serious when they progress and threaten to cause severe pain and/or permanent disability. In other cases, some people with spinal deformity may not even know they have it. Treatment of these conditions aims at minimizing progression of the disease and preventing further growth. Do you NEED spine surgery? Do you have pain that radiates into an arm or leg? Do you have any numbess or weakness in a foot or hand? Have you had an MRI within the last 12 months? As a community service, Northwest Florida Spine mails out a free 36-page Home Remedy Book with customized stretches that can relieve some back and neck pain symptoms. Enter your name and address and we will mail you a copy. Download our free 16-page Back to Life Journal that shows how to get back to golf, tennis, hiking and more with home remedies. Insert your email to subscribe and download. 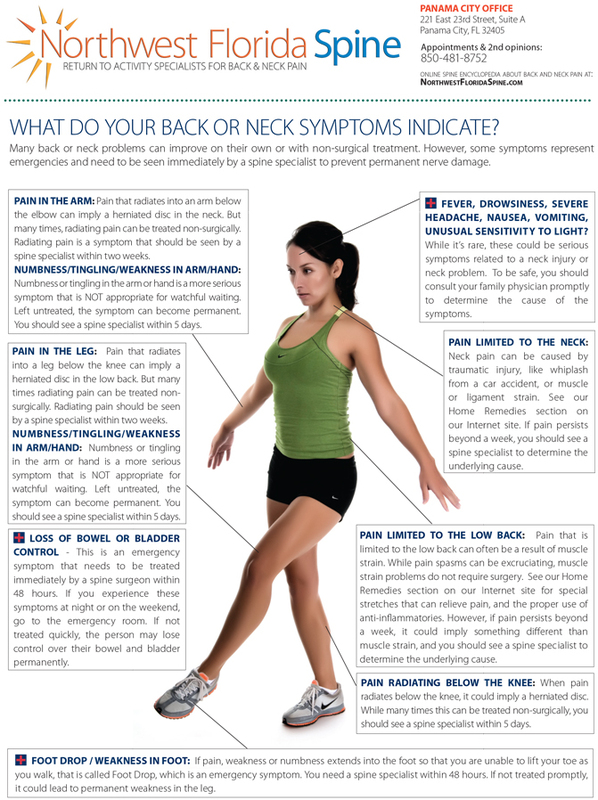 Some symptoms can become permanent if you don’t see the physician with in 24 hours. Find out when you can use “watchful waiting” and when you have an emergency symptom. What do exercises have to do with relieving pain? Research in sports medicine and spine care exercises have shown to help relieve joint, ligament, muscle problems in the legs, arms, neck and back and increase range of motion. Dr. Michael Rohan, Jr. is fellowship-trained in spine surgery, the highest level of medical education in the U.S. Over the past 10 years, Northwest Florida Spine has been referred back and neck pain patients from across the Gulf Coast region for the most advanced minimally invasive spine surgery and artificial disc replacement surgery. Responding to its regional reputation in spine care, in early 2018, the spine center transitioned its name from Panama City Spine to Northwest Florida Spine which reflects the regional draw of patients. Disclaimer: Internet Explorer is now obsolete and has been replaced by Microsoft. If you are viewing in Internet Explorer 8 or older, you will need to update your browser by Clicking here.